Minnesota Republican Rep. John Kline, who chairs the House's education committee, has frozen action in the House on a proposal to institute national standards for how teachers and school staff can safely restrain students. "Chairman Kline believes state officials and school leaders are best equipped to determine appropriate policies that should be in place to protect students and to hold those who violate those policies accountable," said Alexandra Haynes Sollberger, the communications director for the House Committee on Education and the Workforce. "For this reason, the committee has not scheduled any action on seclusion and restraint legislation at this time." Legislation was first submitted three years ago in response to rising concerns about the methods some teachers were using to restrain students who were misbehaving or out of control. Thousands of children have been injured and dozens killed in recent years after being restrained, an ABC News investigation has found. The most recent death occurred in New York, when a special needs student suffered cardiac arrest as a group of staff at the Leake & Watts school pinned him face down on the ground, allegedly because he refused to get off of the basketball court. A spokesperson for the school said that "extensive third-party independent reviews by the police, the District Attorney's office, the medical examiner and state officials support Leake & Watts' own internal investigation and this conclusion: Corey's death was a terrible tragedy." An autopsy ruled Corey's death an accident, saying he suffered "cardiac arrest during an excited state while being subdued." There have been a range of other techniques employed that have raised objections from parents, ABC News found. An elementary school student in Kentucky was stuffed in a therapy bag the size of a duffle bag when he was acting up. 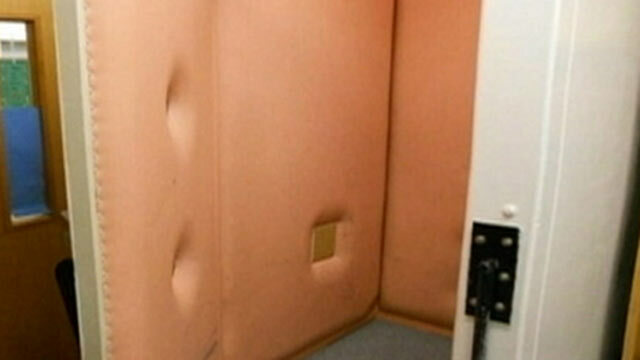 Students in Arizona and Washington state reportedly were being held for long periods of time in so-called "scream rooms," padded closets designed to keep children safe while they calmed down. In Mississippi, the Southern Poverty Law Center intervened with a lawsuit when students reported being handcuffed to a school staircase railing. "Children have died, suffered broken bones and other injuries, and been traumatized," said James Butler, Legislative Affairs Committee Chair for the Autism National Committee (AutCom). "But fewer than one third of states limit restraint and seclusion to emergencies involving physical danger." Rep. George Miller, D-California, said he first introduced the legislation because states that were instituting any rules at all were providing an inconsistent patchwork of rules that left tens of thousands of schoolchildren unprotected. "We see in some states where they're starting to come to grips with this," Miller said. "But it's a very mixed bag across the nation." His legislation initially won passage in the House in 2010 with bipartisan support, but the bill stalled that year in the Senate. Sen. Tom Harkin, an Iowa Democrat, reintroduced the bill this year. Both the Senate bill and Miller's companion bill in the House have failed to move. Objections to the measure have come in part from lawmakers like Kline who believe these matters are best left for states to decide. "States and school districts have a shared responsibility to ensure students attend a safe learning environment," said Sollberger, Kline's spokeswoman. Miller expressed dismay Wednesday about Kline's decision to stymie the bill. "There is no excuse for inaction," Miller said. "In the past, this Committee has worked tirelessly on behalf of children's safety. Our investigations made clear that a federal law is necessary to protect all children across the country and ensure that children's safety does not depend on the state in which they live. I hope that we can put aside politics and ideologies, tackle these issues together, and do what we can legislatively to save children from abuse." From outside Capitol Hill, the primary opposition to the bill has come from school administrators, who would like to see the school officials themselves retain control over discipline in their classrooms. Daniel A. Domenech, who heads the American Association of School Administrators, says the practice of restraining an out-of-control student is an unwelcome but essential part of keeping teachers and other students safe. And the vast majority of the time, he said, school officials are able to subdue a child without harm coming to anyone. Domenech told ABC News his chief concern with the legislation was that it could put teachers in a bind – if a child poses a threat to others and they step in, would they have to risk violating a federal law to do so? Officials in Miller's office said they have attempted to address Domenech's concerns with language in the bill that makes it clear that teachers can intervene to protect other children from harm. But, they said, school administrators have continued to push against the measure, even as the Obama administration has begun to intervene.